recommended for: Fans of Diana Wynne Jones (especially Howl's Moving Castle), Throne of Glass, Harry Potter, Alice in Wonderland, Susan Cooper, Tamora Pierce, and high fantasy in general, particularly if you're sick of the dark gritty stuff and want something fun and light. Bridget tragically died of cancer before she could see her dream realized. Learn more about Bridget from her website and help spread the word about her wonderful book. This is the kind of fantasy I really needed during a bad, horrible week. It brings me back to my childhood, of devouring Diana Wynne Jones, Susan Cooper, and Tamora Pierce. It has a childlike streak but it's not really childish. It won't satisfy devotees of the dark, gritty kind of young adult that's smattered the scene these days. You won't find tortured heroines or brooding bad boys falling in deep, tormented love. No doom and gloom and dystopian flair. No deep psychological issues. This is a high fantasy that doesn't take itself too seriously, and I love it for that. It's The Hobbit to the Lord of the Rings of the darker young adults. The light romance is adorable, there's plenty of adventure and mystery, Kyra is capable and admirable, and there are all sorts of silly elements (like the piglet) that I found humorous and endearing. To be fair, it can get episodic and the writing lacks some of the sophistication of a Sarah J. Maas or Victoria Schwab. Was it deep and lasting? No. Would I demand everyone read it? Not really. Did I enjoy it? Quite a lot. This book was pure fun, and I think that's something that young adult forgets about sometimes. I only regret that Bridget will never get to see the smiles on many readers faces. Like I said, it's a little episodic. You're thrown between accidental run-ins with cute boys named Fred, evil witch ensnarements, scrapes with the castle guard and the King of Criminals. Some of the escapes are a little far-fetched, and the reveals at the end are a bit fairy tale. But that's not all a bad thing. Because it did feel like a fairy tale. Like an Ella Enchanted, although not quite as brilliant as that particular high fantasy. On the plus side, there was always plenty of excitement. I constantly craved to know what was going to happen next. There were also some pretty clever twists. Again, a little far-fetched, but if you suspend disbelief and accept the silliness, it was really a fun read. It's very much a fairy tale sort of high fantasy--and, as I said, devoid of the gloomy seriousness of most modern young adult books. Which is perhaps why so many have said it reads like a middle grade, which I can see. It doesn't go as deep as other books, but it got a lot of traction with me for its pure whimsy. In the vein of a traditional high fantasy, it takes murder, treason, poisoning, and other dastardly deeds and intrigue and casts them as a grand adventure. A little bit Disneyfied, but no less entertaining. It certainly could be enjoyed by middle grade readers, but as an adult and a firm fan of young adult, I still found much to enjoy from it. And so I didn't expect to see extensive world building or deeply psychological characters. I expected kings and queens and witches and spunky heroines and that's what I got. It delves a bit into the more psychological side of things, but in the end, it's all about the thrill. And you get all the fun silly bits, like potions that turn you to wood, hunting pigs, and frilly underwear. Like I said, we aren't getting incisive psychological portrayals here. They feel real, but like everything else, they're on the silly side. Which meant I enjoyed them immensely, but they didn't necessarily stick with me as deeply as another approach would. Kyra had her superficial moments, but I liked her. She was spunky but not annoyingly so and she was very capable. Fred was adorable, that sort of silly sarcastic kind of adorable. Like a real boy you might want to date, not a brooding antihero whom you want equally to save and love. The princess Ariana was a bit cliche on the defiant princess end, but she wasn't a huge part of the story and I still enjoyed her. It does read a bit young, but there's also that irresistible whimsy that kept me going page after page. There were elements that could have been tightened or that made me grit my teeth a bit. Must every book have the heroine go on for lines about how she's absolutely positively not at all bothered by the apparent disinterest of the boy she absolutely positively has no romantic interest in whatsoever, not at all? Seriously. Are all heroines that transparently dense? Now that I've got that out of my system, I thought the style was very simple but had a good atmosphere to it. I felt sort of giddy and pleasant reading it. Like I knew that everything would turn out fine in the end and I was being gently pulled along on this grand adventure. Nothing I'd gush over writing-wise, but solid anyway. Nicely polished, not much to say here. I think the dialogue got a little crossed between whether it wanted to be old-fashioned or modern sounding which made for some awkward moments. 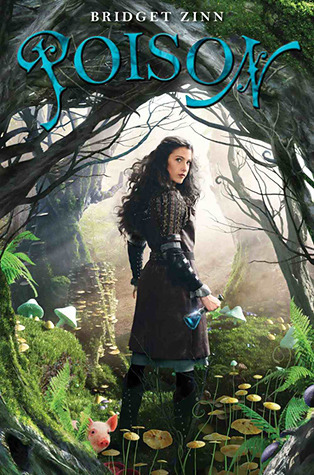 A whimsical high fantasy that brings some cheer and lightheartedness to the young adult genre. I haven't heard of this book, but I do like reading light fun fantasy sometimes, so I'll check this one out. Great, detailed review - I love how you rate individual aspects of the book! It really was fun. Thanks! It's so nice to hear. (: Makes it easier for me to stay organized too. I haven't noticed too many but I jumped on this. What else have you been reading?